We look ahead as we walk forward. We look to the right and to the left when we cross the street. We gaze at store windows and shelves to shop for merchandise. We notice people rushing here and there, always looking. Whether we’re bathing, playing or working, we use our eyes to recognize familiar things and faces. Truly, our eyes are very important and necessary to our everyday lives. But the sense of smell is also important and necessary; it can give us the feeling of both the past and the present. 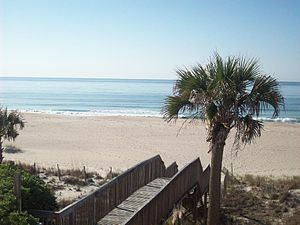 Oceans and sandy beaches, with their fishy smells, bring back memories of visiting Myrtle Beach or North Carolina Beaches with our southern relatives. My granddaughter once commented, “It’s the smell of the south.” The musty moss and evergreen smells take me back to when, as children, we walked through the woods picking ground pine. On our way to class, we often noticed the tantalizing smell of fresh bread coming from a nearby bakery. The smell of chlorine greeted us when entered the YMCA pool area. And every classroom and locker room in school had their own distinctive smell. You wouldn’t need to see it, because the smell would give it away! The smells of the present are just as characteristic. A barnyard can be either pleasant or not so pleasant, but, either way, it’s a mighty homey smell to the farmer! City streets have a different smell. It’s a combination of several odors all mingled together: car exhaust pipes, trucks loaded with building supplies and dump trucks filled with debris all produce odors that are compounded into one strange mixture. Then there’s the smell of oil or gas as you pass a refinery or fill your car’s gas tank. Stopping suddenly brings a smell of burning rubber. When lawns are mowed, there’s a sweet smell of clover blossoms and grasses in the air. Tightly closed houses in the winter may develop a stuffy smell, until Fido or your pussycat lingers at the open door before venturing out. After a heavy rain, the outdoors has a damp fungus smell for a day or so, but, eventually, the sunshine dries things out and removes it. We all have our favorite smells, of course. One of the most pleasant smells I can think of is that of a home-cooked family meal on the stove, when everyone looks forward to dinner at the end of the day. But the best smell — one that can only be described as heavenly — is the soft, cuddly, precious newborn baby smell. We need smells, along with our seeing eyes, to fully experience and appreciate the wonderful world around us! What are you smelling right now? This entry was posted in Angie's Smorgasbord and tagged baby, barnyard, beach, Bread, exhaust, fungus, gas tank, lawn, newborn, Odor, Olfaction, pool, rain, short story, Smell, woods.